Metalforming-industry representatives from around the world gathered a few months ago to discuss solutions to several challenges facing manufacturers. The first problem discussed: fracture modeling. 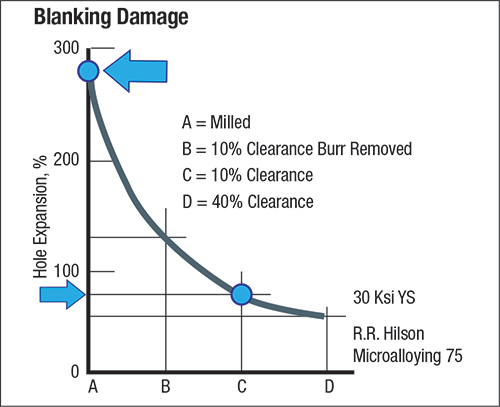 The complaint read: The forming-limit curve (FLC) is no good because it cannot predict the onset of cracking during blanked-edge stretching. Fig. 1—Typical hole expansion is 80 percent. A milled hole will provide 280-percent expansion. Failure occurs well below the value predicted by the FLC. The solution we discussed centered on the fact that the FLC depends on the n-value. The n-value of the workpiece material cannot be used, as it does not represent the n-value of the material after forming, shearing and other deformation. Much of the deformation and damage often goes back half the sheetmetal thickness from the cut edge. Fig. 1 shows the dependency of edge stretch on clearance and burr removal prior to a hole-expansion test. For this sample, the 10-percent clearance allowed a hole expansion of 80 percent. When the hole was milled, the hole expanded by 280 percent. One can imagine the cracks, rough edges, workhardening and other damage during cutting and all other processing of the edge. This makes the prediction of fracture severity and hole expansion very difficult and usually impossible. Fig. 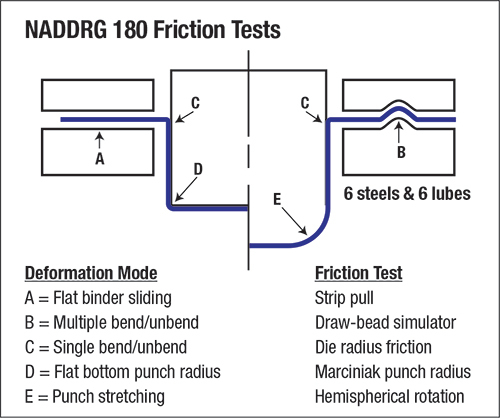 2—A lubricant that works well for the upper three tests (A, B, C) will be a poor lubricant for the bottom two tests (D, E) and vice-versa. A major research team was established with experts from the automotive, steel, aluminum and metal-stamping industries. Several universities were hired as contractors. LSDyna did the computer analyses. While some minor bits of information were gained, after 5 yr., the final friction answer was, “Cannot track CoF.” There are so many constantly changing CoF combinations that the numbers have no meaning.